Koduri Maragatha Mani Keeravaani, better known as M. M. Keeravaani (Telugu: ఎం.ఎం.కీరవాణి ) or under the alias Maragatha Mani, M. M. Kreem, is a National Award-winning music composer who works in Telugu, Tamil, Kannada, Malayalam and Hindi cinema. 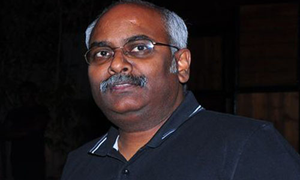 Keeravani first began his career as an Assistant music director with the noted composer Chakravarthy in the year 1987. He assisted in some movies like Collectorgari Abbayi and Bharathamlo Arjunudu in the later 80's. During this time, he also sought the guidance of the veteran lyricist Veturi for over a year. Keeravani's first big break as an independent musician came with the film Kalki in 1990. But the film never got released and the soundtrack also went unnoticed. It was director Mouli's 1990 film Manasu Mamatha that brought him to the limelight and considered his first released movie. However, it was Ram Gopal Varma's blockbuster film Kshana Kshanam (1991) that made Keeravani an established music director. All the songs of this movie went on to become top chartbusters and Keeravani was flooded with offers from all across south Indian film industries. His first major Hindi film was Criminal. Keeravani is also a singer. He is known for his contributions to the Telugu film industry with compilations for hit films like Annamayya. He has composed music for Hindi films such as Is Raat Ki Subah Nahin (1996), Sur: The Melody of Life, Zakhm, Saaya, Jism, Criminal, Rog and Paheli. In Malayalam, he has scored for films like Neelagiri (1991), Soorya Manasam (1992), and Devaraagam (1996). He has composed for over 200 films in various Indian languages and is still composing music for several upcoming films.